Vancouver, British Columbia--(Newsfile Corp. - February 12, 2019) - Forum Energy Metals Corp. (TSXV: FMC) (the "Company" or "Forum") announces a financing of up to 10,000,000 units at a price of $0.05 per unit to raise up to $500,000 to commence initial preparations for a summer drilling program on its Janice Lake sedimentary copper/silver project and for working capital. The units will be comprised of one common share of Forum and one warrant entitling the holder to acquire a further common share at a price of $0.10 for a term of 3 years. Forum may pay finders' fees in connection with the financing in accordance with the policies of the TSX Venture Exchange. The financing remains subject to the acceptance of the TSX Venture Exchange. The Company is pleased to announce the appointment of London-based Burns Singh Tennent-Bhohi to the Board of Directors. Burns is the Director and CEO of Glenpani Capital, a private investment company that invests in financial markets and provides consultancy services to AIM, TSX/-V, & ASX mining and exploration companies. He has assisted in numerous companies to restructure, refinance and provide strategic corporate-planning to broaden market exposure and capital engagement. Burns brings an international network of corporate brokers, project-level financiers, asset-banks and technical teams. Burns holds a number of directorships/senior management roles within the corporate world and graduated from the University of Glasgow with a degree in Economics & Social Sciences. Mr. Tennent-Bhohi commented, "It is with great pleasure and excitement that I join the Board of Forum Energy Metals. I believe that the mining and natural resource sector represents the most distressed asset-class in global industry. The macro-indications strongly suggest that we are experiencing key dislocations that will provide those with capital exposure to the mining and natural resource sector with favorable upside. Forum has survived this down-cycle to the credit of its management and its underlying assets have key exposure to commodities that mitigate environmental damage; Clean Energy [Uranium] & the EV Revolution [Copper & Cobalt]." The Company also announces that, in accordance with the Company's stock option plan, it has granted to Mr. Tennent-Bhohi incentive stock options to purchase up to an aggregate of 250,000 common shares exercisable on or before February 12, 2024 at a price of $0.10 per share. In 2018, Forum completed a highly successful first pass drill program at its Janice Lake sedimentary copper/silver project. All 4 drill holes intersected shallow chalcocite, bornite and native copper mineralization above 80m in depth, including Hole FEM-01, which intersected 19.0 m grading 1.0% Cu and 6.5 g/t Ag. Logging of the drill core and petrographic studies suggest that the mineralization is hosted by mafic-rich stratigraphy within more felsic units, opening the possibility for multiple layers of mineralization within the formations. Mineralized drill holes up to 1km apart across strike suggest that the mineralized strata is at least 500m thick. To test for this scenario, Forum's technical team has proposed a series of drill fences across multiple high priority target areas identified along a 6 km mineralized trend (the Janice Trend) for drill testing in 2019 (See Figure 1). In addition, the Genie Trend, which parallels the Janice Trend, appears to be a repeated section by faulting of the prospective stratigraphy, significantly expanding the resource potential of the Janice Lake project. Forum has received expressions of interest from various parties, some of whom have initiated due diligence reviews. Ken Wheatley, P.Geo. and Forum's VP, Exploration and a Qualified Person under National Instrument 43-101, has reviewed and approved the contents of this news release. 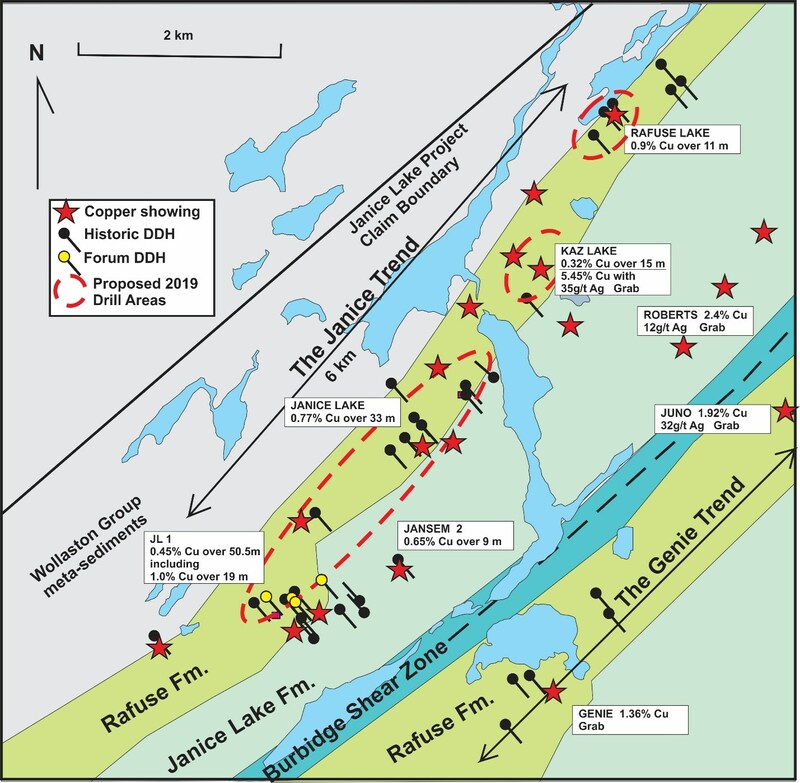 Forum Energy Metals Corp (TSXV: FMC) has the option to earn a 100% interest in the Janice Lake property from Transition Metals Corp by making further staged cash payments over the next three years. The Company explores for energy metals, including copper and uranium in Saskatchewan, Canada's Number One mining province, in addition to cobalt in Idaho and Oregon. Forum is well positioned for when the uranium market rebounds with interests in 7 drill ready projects in the Athabasca Basin, all assembled by a highly experienced team of exploration professionals with a track record of uranium mine discoveries in Canada.